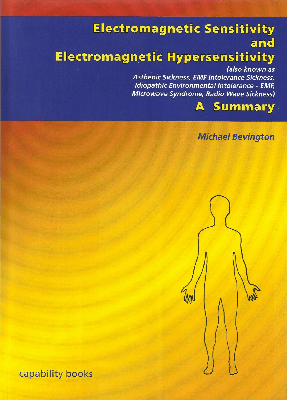 A very well researched book on EHS was published in 2013 called Electromagnetic Sensitivity and Electromagnetic Hypersensitivity – A Summary by Michael Bevington. 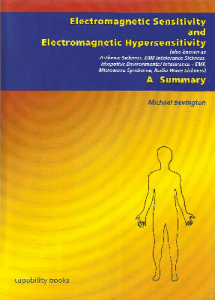 Electromagnetic Hypersensitivity is categorised as a multisymptomatic ‘el-allergy’ in the Nordic classification of 2000 (R.68.8). Its symptoms are ‘certainly real’ and it can be a ‘disabling condition’ (W.H.O., 2005). It was first recorded in the mid 20th Century as an occupational illness, but it has now spread into the general population through environmental exposure from increasing levels of electro-magnetic fields and radiation.